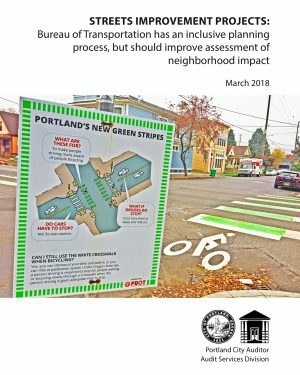 Projects completed by Portland’s transportation bureau are making streets safer, but the agency should do more to assess how surrounding neighborhoods are impacted by changes to traffic patterns. That’s the key takeaway from a report released today by the Portland City Auditor. 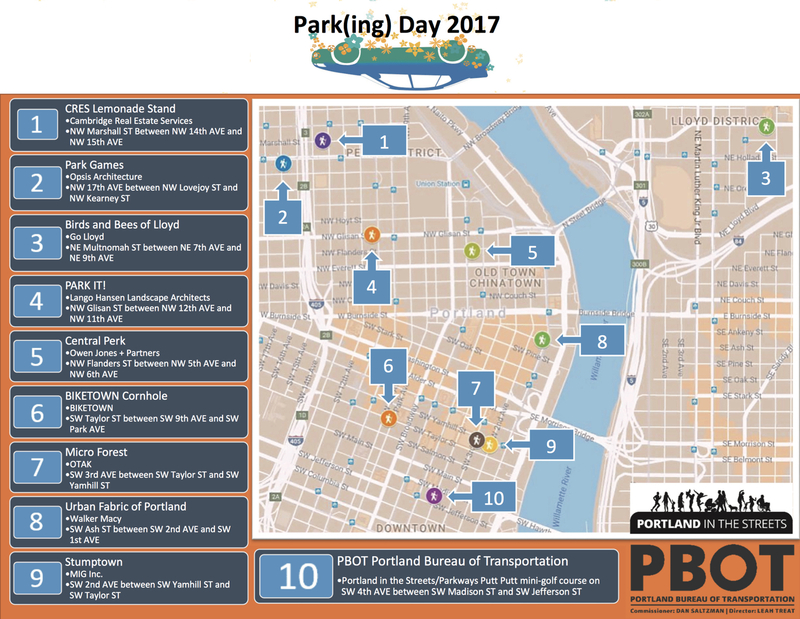 The audit looked at 14 recently completed Portland Bureau of Transportation projects and selected two for closer analysis. They looked at safety projects on East Burnside (SE 15th to Laurelhurst Place) and on SE Division (from 60th to 80th). In both projects PBOT applied standard safety upgrades like lane reconfigurations, improved crossings and lower speed limits. In both projects the City Auditor found that PBOT met their stated goals of safety and maintaining access to businesses. However, the report says PBOT needs to take a closer look at what happens to adjacent streets and business patterns after projects are completed. Map detail of PBOT’s $79.5 million transportation project investment strategy. For the first time in decades, the Portland Bureau of Transportation has money to spend. Real money. The lack of people dressed like traffic cones is a nice touch. I’m sure your inbox and timelines are full of well-meaning organizations urging you to “be safe and be seen” this time of year. These are important messages, but it’s annoying how they usually focus on vulnerable road users. It makes sense intuitively, but that paternalistic approach fails to address the elephant in the room — or should I say the huge, powerful steel vehicles in our streets. “Dress up like a traffic cone if you want to survive winter!” these campaigns too often say. That’s why I was very pleased to see the latest statement from the Portland Bureau of Transportation. “‘Be Seen. 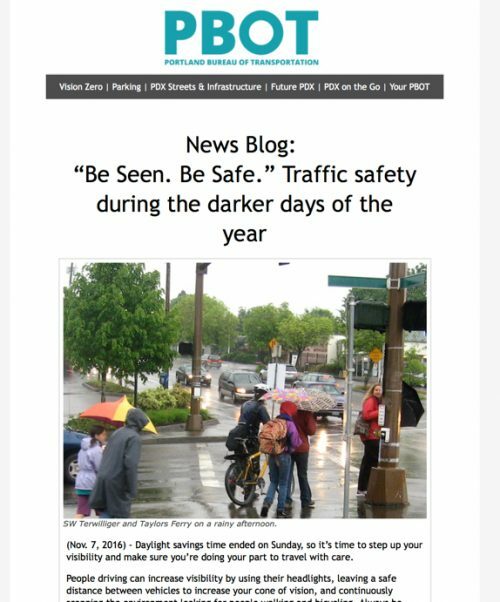 Be Safe.’ Traffic safety during the darker days of the year,” the headline reads. City bike coordinator Roger Geller leads the BAC on an annual bike tour. 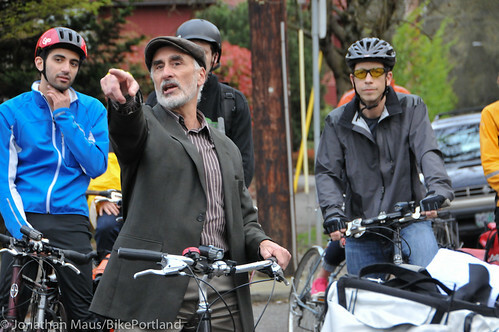 If you want to make biking better in Portland, there’s a great opportunity to put your passion into action: The city’s official Bicycle Advisory Committee (a.k.a. “the BAC”) is currently recruiting new members. The BAC is a citizen-led body that advises all city bureaus, council members, and the Mayor on matters relating to bicycling. When a construction project will impact a major bike route, the BAC is there to sort out the detour and make sure the work-zone is bike-friendly. When a big planning document is about to be updated, the BAC is there to tweak the language and add key provisions. Long before a big project breaks ground, the BAC is there to sweat the details before the design is finalized. Multnomah County Youth Librarian Barbara Head at Bike Storytime in Hillsdale this morning. The City of Portland and Multnomah County Library (with an assist from Metro) have teamed up on a novel way to promote National Bike Month: They’re hosting an art contest with a grand prize of having the winners’ design installed as a bike lane character. Ever notice how some of the bike lane symbols around town have extra special flair? Some are subtle little twists and others are nothing short than a work of art. It’s a tradition that the Portland Bureau of Transportation started back in 1999. And now four lucky young Portlanders will get a chance to have their vision turned into a piece of infrastructure. The “Bike to Books” program kicked off this morning at the Hillsdale Library. With the library’s book bike (more on that later) parked in the entrance, over a dozen pre-schoolers were treated to a special, bike-themed storytime. 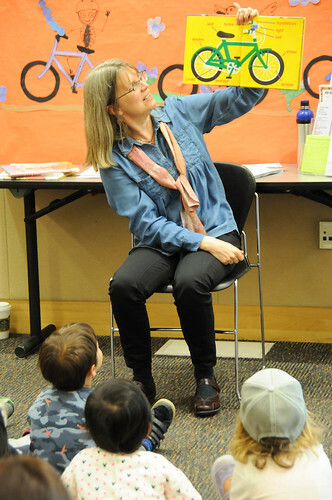 Youth Librarian Barbara Head kept the kids entertained (no easy task at that age) with bike books and bike-themed songs. It’s all part of an effort to get people of all ages to bike to the library during the month of May. Any Multnomah County resident in kindergarten to 12th grade can grab a coloring contest flyer from a library or online and give it your best shot. The contest is open all month long and entrants must return the finished art to a library branch. Four grand prize winners (one for each age category) will get their bike lane art installed. The second place prize is four passes to The Lumberyard Indoor Bike Park and third place gets a Nutcase helmet. 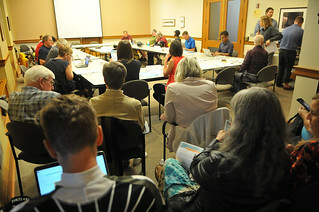 The city’s bicycle advisory committee is different, but you get the idea. 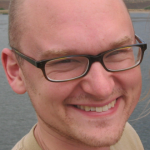 Not everybody loved the local gas tax that Portland voters approved in May. But most Portlanders can probably agree that now that it exists, it ought to be spent as promised. There’s a strong possibility that the tax might bring in more or less money than expected, or that the city might eventually consider changing the project list in ways that violate the implicit promise to voters that it made when it created the list. If either of those things were to happen, the main watchdog institution will be a volunteer oversight committee that’s currently recruiting members. 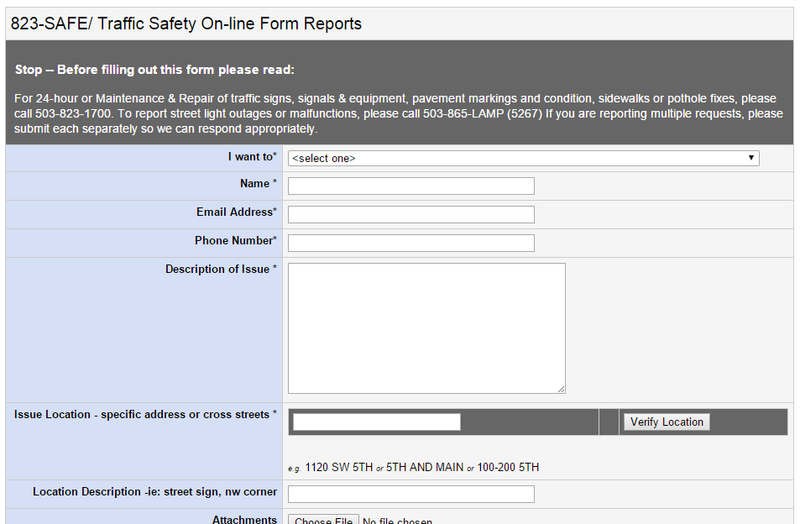 There’s now a keyboard-ready alternative to the Portland Bureau of Transportation’s excellent 823-SAFE hotline. The city’s hotline has a great reputation among those in the know, who use it for things as diverse as a poorly timed traffic signal or a low-hanging branch. Even on issues that can’t be fixed immediately, a history of reports about a given location can alert city staffers to a bigger project worth tackling. The phone hotline has been around for over a decade (at least), and many people also use the safe@portlandoregon.gov email version. 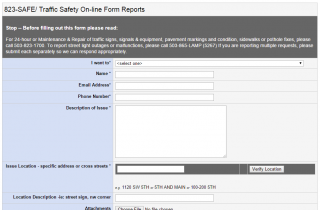 Now the City of Portland offers a web-based version. 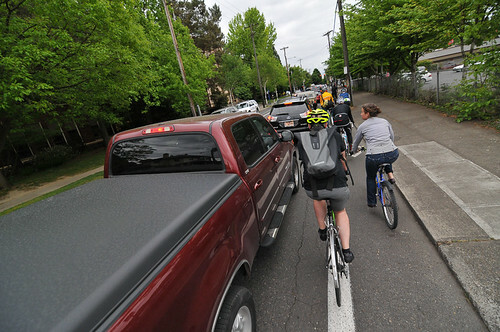 The bike lanes on SE 26th run in front of Cleveland High School and carry about 600 to 800 people daily. Because 26th Avenue won’t be repaved for another year or two, the city will have time and data to try to persuade the Oregon Department of Transportation to reverse its decision. The Portland Bureau of Transportation confirmed Thursday that it has agreed to remove the bike lanes from SE 26th Avenue near Powell in order to get the state’s approval for a new signal at 28th. A city spokesman said that because 26th Avenue won’t be repaved for another year or two, the city will have time and data to try to persuade the Oregon Department of Transportation to reverse its decision. But an ODOT spokesman said the state can’t say what data it might or might not find persuasive.